As part of the Tritone III Series, the BADAZZ III is a Jazz type shaped guitar pick consisting of 3 useable tips. Easily glides on strings, you can shred up to 200mph without the string getting caught on the pick. Pick won't wear down fast, been using the same pick for a year now and it still is the same as when I bough it. 2mm is huge, but due to the material of the pick it feels so comfortable is my hand despite that I've been using .88mm or Heavy Gel picks for years. 4.5 stars on value as it costs 6.99 plus tax, but as long as you don't lose it like I did then I would give it a 5/5. 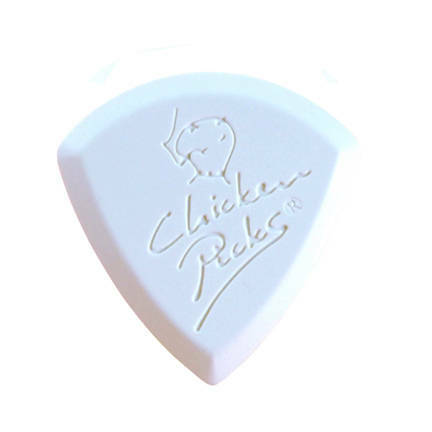 Chicken Picks vs Nylon Picks! - Can Changing Picks Improve Your Tone?